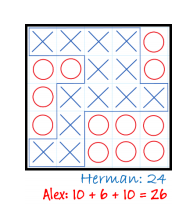 Herman and Alex play a game on a $5 \times 5$ board. On his turn, a player can claim any open square as his territory. Once all the squares are claimed, the winner is the player whose territory has the longer border. Herman goes first. If both play their best, who will win, or will the game end in a draw? I will call the players $A$ and $B$. The game is made trivial by the following observation. Let $s_A$ and $s_B$ be the final scores of the two players. Let $x_A$ be the number of outer perimeter segments that $A$'s region touches, and the same for $x_B$ with $B$. No matter how the game is played, $s_A-s_B=x_A-x_B$. This is because in $s_A-s_B$, all interior segments cancel out. Therefore, all that matters is grabbing up the outside perimeter segments. The best strategy is to claim a corner if possible, claim an edge square otherwise, and then play arbitrarily once the outer squares are all gone. $A$ and $B$ will each claim two corners and six edge squares, and therefore tie. Not the answer you're looking for? Browse other questions tagged combinatorics puzzle combinatorial-game-theory or ask your own question. What is the optimal losing move? Is there a generic algorithm to solve m,n,k games?